These days, funeral companies offer much more than the usual services. There are two types of death scenarios that every family has to deal with; and this is one of those things that nobody ever gets an exemption from. First is sudden death such as from an accident or a violent crime. In this scenario, shock and acceptance are the immediate family’s main challenges, particularly if the deceased is young and otherwise has no reason to move onto the other side. The second scenario is when the death comes after a prolonged illness and death has been something of a foregone conclusion. In this scenario, acceptance of the death is rudimentary and often death itself may be seen as something of a relief not just for the deceased but for the immediate family as well. The shock, on the other hand, may come from the sheer economics that invariably accompany dying. When you come to think about it, perhaps the reason why humans have a genetic aversion to death is because dying is expensive. In many cases, especially after prolonged hospitalisation and medication, the hospital bill is a certifiable health hazard. But that is not all. The family of the deceased now has to turn its attention to holding the wake and subsequent funeral rites. Now the economics become even more intricate, amusing even if you are not personally involved. When my mother died way back in 1992, we paid less than 30K for the funeral services which at the time included the casket, the embalming, the lighting at the wake and the limo service for the deceased. Alright, the hearse. Over the weekend, we laid to rest an aunt; and from my cousins, I learned that they had to pay many times more than what we had to pay back in 1992. Moreover, I was told that there were several packages available to choose from. The one that they chose included sacks of rice and candies supplied by the funeral company, ostensibly for people who came to condole with the family at the wake. On top, of course, of the usual funeral services all the other funeral companies offer. 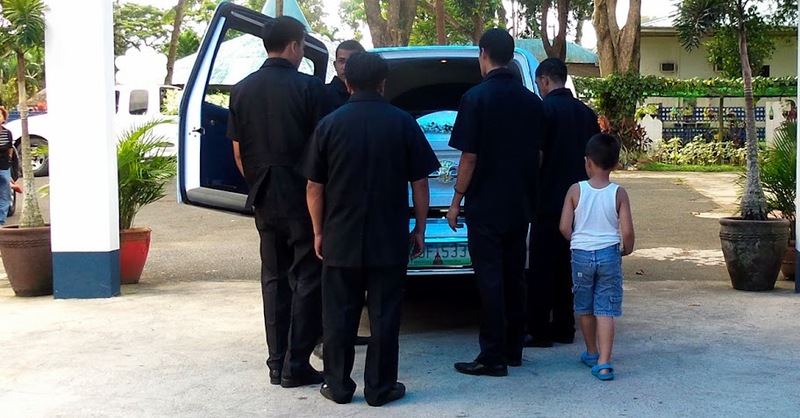 During the interment rites, a black-painted van was thoughtfully provided for the members of the immediate family. 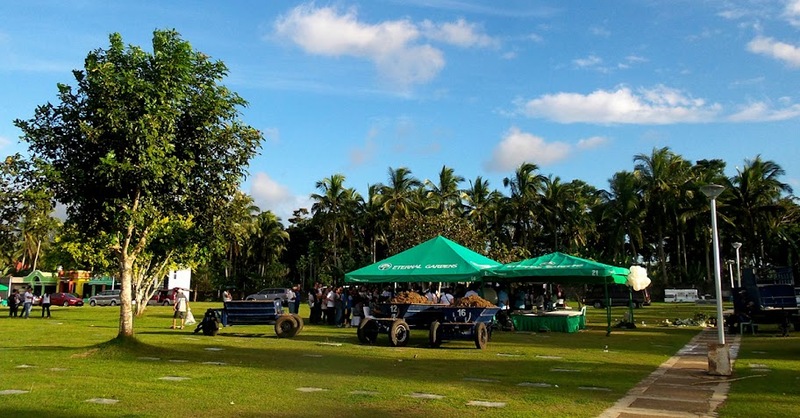 What I failed to ask was if the tarpaulin tent set-up at the memorial garden – with a master of ceremonies – was another value-added service of the funeral company or was instead provided by the memorial park. Of course, ultimately the costs for these value-added services are thrown back at the customers by the funeral companies, no different conceptually from a diner choosing the number of side dishes to go with the chicken at Kenny Rogers’ Roasters. What all these marketing strategies that the funeral companies now employ tell us is that the industry has become cut-throat. To understand why, let us take a look at a few statistics. According to the World Bank, the Philippines’ estimated crude death rate in 2013 was 6.01 per 1000 people. Using this against the estimated Philippine 2013 population of 98.39M, then a total of 591,323.9 people is calculated to have died that same year or 1,620 people per day. Applying the same calculations to Lipa City where the 2010 National Census placed the population at 283,468, then the number of people we can estimate to have died each year in recent years was 1,703.64. This estimate will be slightly off because the 2013 death rate is applied against a 2010 statistic; but nonetheless gives us all a workable number. From this, we deduce that in recent years, more or less a total of 4.67 people die each day or 140.02 per month. I do not know exactly how many funeral companies there are in the city, but assuming that there are 10, then each has a straightforward potential monthly average of 14 dead people. We expect, but naturally, that not all the families of each of the 14 will be able to afford the funeral companies’ higher end products. The financial dynamics will differ and we do not have access to each funeral company’s operating costs. However, the statistics above do give us an insight as to why the funeral industry has become somewhat cut-throat. Unless there is a bit of panic-dying, each company has to learn how to market and compete to gain a larger share of the market. Of course, the more intricate the products they sell, it goes without saying that the more expensive they also become.